Angel Di Maria’s scooped lob in Manchester United’s 5-3 defeat to Leicester City has been voted as the Premier League’s best goal of the season. The Argentine’s effort topped the poll ahead of Philippe Coutinho’s strike against Southampton in the final round of voting on the Premier League’s official Twitter page. To get to the final, Di Maria’s goal won the vote ahead of Jermain Defoe’s strike against Newcastle United and Charlie Adam’s effort inside his own half against Chelsea. Di Maria struggled in his debut season at United after joining from Real Madrid for a British record fee of €75 million last summer but has insisted that he intends to stay at Old Trafford this summer. “I have just finished my first season playing for Manchester United,” he told The Sun. “It was a hard season for me. I think it was hard because it was another country and another league, and this league is harder than the Spanish one. So, I couldn’t adapt myself as I wanted to. Di Maria is currently training with the Argentina national side ahead of the Copa America this summer, with Gerardo Martino’s men to face Bolivia in a warm-up game on Saturday. Ronaldinho believes that Liverpool star Philippe Coutinho would fit in perfectly at Barcelona. The Brazil international Coutinho has enjoyed a thoroughly impressive season at Anfield, earning a spot in the Professional Footballers’ Association (PFA) Team of the Year while also being voted as the club’s Player of the Season. And two-time World Player of the Year Ronaldinho – who won two Liga titles and a Champions League trophy during his time with Barcelona – feels Coutinho would be a great addition for the club, with Xavi heading for the exit this summer and Andres Iniesta heading into the latter stages of his career. “He has had a fantastic season,” Ronaldinho told The Daily Mail. “He has been one of the best midfield players in Europe. When you realise that he has been playing in a team that has not been performing well, that is an even bigger achievement. “I can’t speak for him and I can’t speak for Barcelona, but I know what they look for in a player and he has all those qualities. “After all those years at the club, Xavi has left and Iniesta is now in his 30’s – they will need to address that. That is why I think Barcelona and Coutinho would be the perfect fit. Coutinho has been included in Dunga’s 23-man Brazil squad for the Copa America and their first game is against Peru in Temuco on June 14. Watch Ozil & Messi in action for Gatorade! Arsenal star Mesut Ozil and Barcelona forward Lionel Messi are among the players to feature in a spectacular new Gatorade film. The duo take to the field with team-mates including Santi Cazorla, Joel Campbell, Pedro, Xavi and Jordi Alba to show off their skills. Gatorade are the official sports drink providers of both clubs, as well as the likes of Liverpool and Juventus. Also featured in the video is Philippe Coutinho, who stars alongside Reds team-mates Lazar Markovic and Javi Manquillo, and Juve playmaker Andrea Pirlo, who is joined by Angelo Ogbonna and Martin Caceres. After some sensational passing, dribbling and tackling, one player hits the back of the net. Watch the video in full above to find out who! Chelsea winger Eden Hazard has been named the PFA Player of the Year, beating stiff competition from Manchester United’s David De Gea and Tottenham’s Harry Kane. While some of his team-mates have fallen out of form in 2015 – suficiently so, in the case of Cesc Fabregas, to fall out of the PFA Team of the Year – Hazard has maintained the high level of form which he showed in the first half of the campaign. Last weekend he scored the decisive goal against Manchester United at Stamford Bridge, which finally killed off Louis van Gaal’s faint hopes of winning the title, which came a week after laying on a late, important winner for Fabregas at Queens Park Rangers. His eye-catching skills and important goals have given him the edge over his Premier League colleagues, including De Gea and Kane. The United goalkeeper has been crucial to his team’s progression this season, particularly in the early months when he made a number of spectacular saves to help bail out a creaky defence as Van Gaal experimented with the team he inherited from David Moyes. 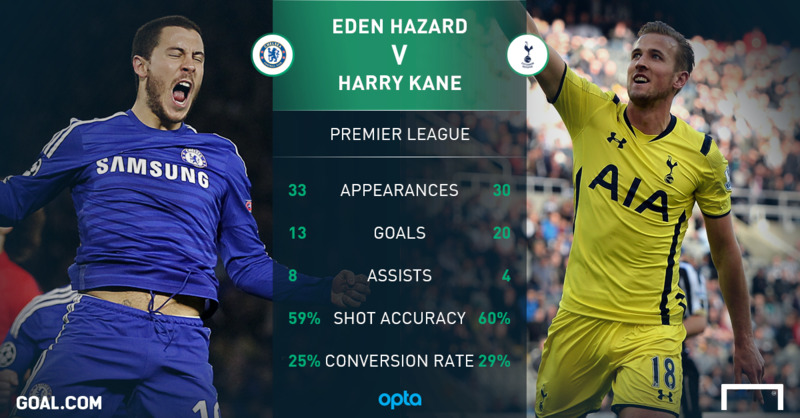 Tottenham striker Kane provided the most impressive competition for Hazard. 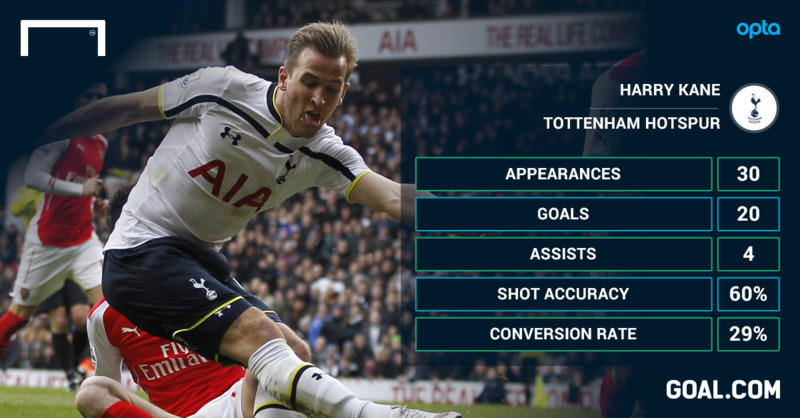 The 21-year-old has scored 30 goals – 20 in the Premier League – in a stunning breakthrough season at White Hart Lane. The Englishman has been a central member of Mauricio Pochettino’s Spurs project and he earned his first international call-up earlier this season as a result. Liverpool playmaker Philippe Coutinho, Arsenal’s Alexis Sanchez and Chelsea striker Diego Costa, who has been hampered by injuries and suspensions in 2015, were also nominated for the award. Chelsea have dominated the PFA Team of the Year, with six Blues players named in the line-up, including Diego Costa, Eden Hazard and Nemanja Matic.John Terry, Branislav Ivanovic and Gary Cahill complete the list of Chelsea stars although there is no place in the team for Cesc Fabregas. Manchester United’s David De Gea is the team’s goalkeeper while Tottenham striker Harry Kane and Southampton’s Ryan Bertrand complete the line-up. 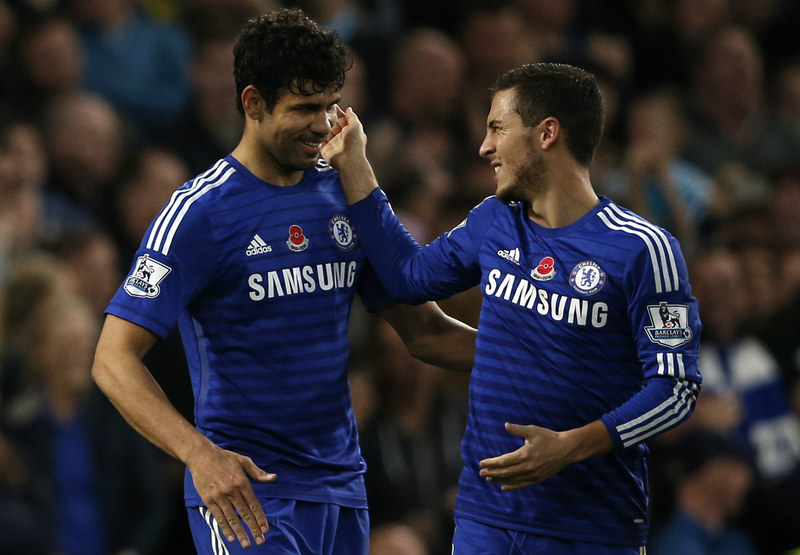 The Professional Footballer’s Association (PFA) have announced their shortlist for this season’s Player of the Year award, with Chelsea duo Eden Hazard and Diego Costa heading the list. The pair are joined by Manchester United’s David De Gea, Arsenal’s Alexis Sanchez, Liverpool’s Philippe Coutinho and Tottenham’s Harry Kane. There is no place, however, for the likes of Nemanja Matic, Cesc Fabregas, Sergio Aguero or Morgan Schneiderlin. Hazard, De Gea, Coutinho and Kane are also nominated for the Young Player of the Year prize alongside Chelsea’s Thibaut Courtois and Liverpool’s Raheem Sterling. PFA Player of the Year shortlist: Diego Costa (Chelsea), Philippe Coutinho (Liverpool), David De Gea (Manchester United), Eden Hazard (Chelsea), Harry Kane (Tottenham), Alexis Sanchez (Arsenal). PFA Young Player of the Year shortlist: Thibaut Courtois (Chelsea), Philippe Coutinho (Liverpool), David De Gea (Manchester United), Eden Hazard (Chelsea), Harry Kane (Tottenham), Raheem Sterling (Liverpool). 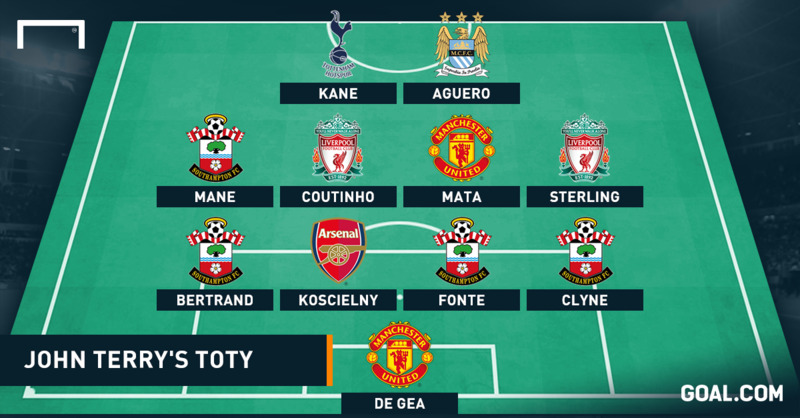 Chelsea captain John Terry has named his PFA Team of the Year, with rumoured Blues target Raheem Sterling included as well as four Southampton players. With players unable to pick their team-mates, Terry has sprung a few surprises, as Nathaniel Clyne, Jose Fonte, Ryan Bertrand and Sadio Mane all feature in his XI. In goal, David de Gea gets the nod ahead of Tottenham star Hugo Lloris, while Laurent Koscielny partners Fonte in the heart of the defence. Two Liverpool players are also selected, with Philippe Coutinho and Sterling – who Jose Mourinho recently advised Liverpool to sell – named in midfield, along with De Gea’s Manchester United team-mate Juan Mata. Up front, Spurs striker Harry Kane – who scored twice against Chelsea in a 5-3 win on New Year’s Day – joins Manchester City’s Sergio Aguero, who has hit 23 goals in all competitions thus far this season. Morgan Schneiderlin, however, may feel unlucky to have missed out on Terry’s team, given his fine form this season, while Alexis Sanchez – who has enjoyed a superb debut season in the Premier League – is another notable snub.